This might come as a surprise to you, but I’m not a dad. I know, I was shocked too. But it seems I’m a female and females cannot be dads, only moms. So lame. 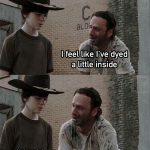 Anyway, I LOVE dad jokes. They’re funny, brilliant, and not lame at all (sometimes). So I thought I’d share some with you today. 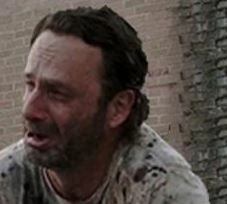 “[At Dad Jokes Anonymous meeting] Hi Everyone, I’m addicted to dad jokes. But wait. 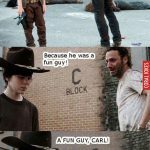 This wouldn’t be a proper dad joke post without Rick Grimes, because he’s the king of bad dad jokes. Drop your favorite dad joke in the comments to enter the ULTIMATE DAD JOKE CONTEST. 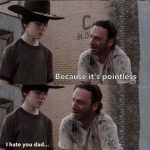 Competitors will have their dad jokes posted on a poll and you will choose the winner! The winner will get a certificate of BEST DAD JOKER. And if you’re like me, you don’t necessarily need to be a dad to join. So make sure to reblog and forward this to all dad joke lovers out there! Omg I love this post so much. 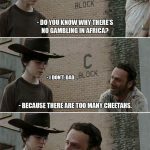 I’ve seen loads of this images with Rick and Carl floating about, but you’ve shown me a couple of different ones and definitely cheered me up on my way to work, haha! I know right? It shocked me too! Triumph turned to tragedy when the scientist who successfully cloned the first human being pushed that same person out of a window for making inappropriate remarks. The police are charging him with making an obscene clone fall. Dammit I missed this one!